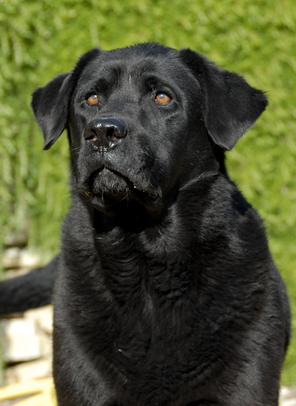 Labrador retrievers have long had the reputation of being well-tempered, highly trainable, trustworthy, and a breed suitable for families with children. News reports are rare about a Labrador retriever inflicting serious dog bite injury to a child. There are exceptions, however. For example, in April 2014 in Port Richie, Florida, a chocolate Labrador retriever viciously attacked the face of an eight-year-old girl. The lab was a family dog that had recently started showing signs of aggression towards children. The victim entered the back room of her home to retrieve a toy. The dog was placed there earlier for safety reasons. When the girl entered the room, The girl was attacked by the dog when she entered the room. She sustained serious lacerations to her face, eyes, nose, and ears, and reconstructive surgery may be needed. Internet news stories about this incident were widely reported, but the stories did not specify the circumstances present at the time of the attack. It is likely the girl had a play date with some friends who came to visit, and this necessitated the mother placing the dog in the back room. Albeit the dog was in the back bedroom, it still may have heard the children playing, and this may have been the stimulus which engendered its aggressive tendencies. The dog did not attack the child because of resentment for being placed in the back room. What does this incident tell us? Clearly it shows that children cannot be trusted to be in the presence of all Labrador retrievers (especially males), despite the breed’s reputation of being good family pets. Breed stereotyping should not be done with any breed. Caution is needed in most situations when children are in the company of a large dog of any breed they do not know that well. Depending on the circumstances and the background of the dog, the chances of an attack on a young child increases substantially because children often act in ways that could be provocative to some dogs. Epidemiological studies have consistently shown that children under 10 years of age are the victims most serious dog bite attacks.